Panic! Panic! The captain has been kidnapped!! The new cadets will need to rescue him! 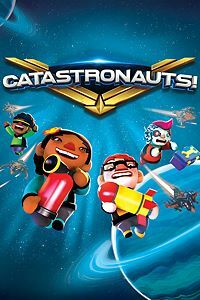 Developed and published by UK indie studio Inertia Game Studios, Catastronauts is an action game where cooperation is the key for success. You and up to three other friends, cadets of the Space Fleet, will engage in battles against enemy ships, in which you will need to manage the defenses of your ship, repair damaged parts and equipments and deal with space hazards in a funny party game! Now join us in the review for this game and prepare to take these lizard-like aliens out of our galaxy! Catastronauts is an action game created to be played in local multiplayer. You and your friends will manage your ship, using weapons and defense systems, while confronting enemy ships. At the top of the screen you have two health bars, one of your ship and the other of the enemies. Your objective is to empty their bar before your bar reaches zero by using your guns and repairing the damage caused to your ship. As you progress in the game, new mechanics (weapons, ammunition and hazards) are introduced in the gameplay, making things more and more challenging! Gameplay: The first thing that came into my mind when I first played it was “oh my God, they made a space Overcooked!”. The similarities do exist, but this is far from being a bad thing. Your ship is under attack and it’s up to you to repair it and fight back! You have at your disposal a repairing box and a fire extinguisher which must be used to prevent your ship to be destroyed. You can use the guns of your ship to fight them back! Some take time to reload, others must reloaded by you, others need more than one astronaut to be operated… There’s a good variation. Levels are organized in hubs with four stages each that need to be completed before having access to the fifth stage. Complete it and you gain access to the next hub and continue the story (plus a new character becomes available). Best in co-op: This game has been designed to be played with your friends in local good old couch coop. Yes, you can play it all by yourself (switching control between two astronauts), but playing it with a friend is more more enjoyable. The tasks of managing your guns and repairing your ship are done much faster (and messy!) with real life friends. Those who play with me say I become bossy when playing games like this so I hope your friendship can overcome this alien threat! Visuals: Graphics in Catastronauts are colorful and simple, it works perfect for the game! Visuals promote a child friendly approach to the game, with little jokes all around. The visual effects of weapons are very good and animation of characters are great. Sound: With good sound effects and music, the sound in Catastronauts provides the perfect mood for the game: a light-hearted humor that just gets better stage after stage. Game progress: Each stage takes no longer than five minutes to be completed. The more efficient you are in managing your ship, the sooner you’ll unlock the next levels. The game introduces new mechanics to the gameplay at (almost) each new level, keeping the experience always fresh to you and your friends. Later levels will combine many of these mechanics, making it nearly impossible to complete it alone and too complex and chaotic (and funny!) to be completed with friends. A perfect measure of challenge for me. Your performance in each stage is evaluated in stars, from one to three. You can progress in the game and unlock new levels by only taking one star in each level, but if you are a completionist like me, you will aim for three stars in all stages! Story: The story of the game is too simple and could have more meaning. I love the light-hearted conversations with the captain and the leader of the enemies and the bulling they do, but there could be more depth to the Space Fleet and conflict. Not that it will decrease your fun with the game, but I see it as a lost opportunity. Inspiration: As mentioned before, the first thing that came into my mind when I started this game was Overcooked from Ghost Town Games. And other players that helped me during this review had this same feeling. There are some similarities between then,but it’s nothing bad at all. Catastronauts has enough personality to distinguish itself. Just think about it this way: if you liked Overcooked, there are great chances you will like Catastronauts too. Duration: This isn’t exactly a bad thing, but as the game contains about 30 stages (which I haven’t yet completed all, I must confess), I’m already feeling there could be more 🙁 . This is that kind of game you don’t want it to end. Catastronauts [score:90/100] A great idea with excellent execution, Catastronauts is a brilliant game! Challenging without being unfair. It is made to be enjoyed with friends, but you can also play all by yourself. It has a simple premise and a simple presentation, but so well made and delivered that it will make your game nights with friends exciting! Enough talking, cadet. The Space Fleet needs! Get aboard!